I had intended to wax lyrical on the subject of Firkušný’s Janáček. It would really only be a question of discussing which of the two recitals one favoured – this ex-RCA Red Seal recording made in June 1989 just as the Velvet Revolution brought down the Communist Curtain – or the DG LP set, which the Czech pianist taped back in 1971. The fruits of that earlier session can be found on DG 20th Century Classics CD 429 857-2. There would be a small tussle over the respective merits of the two books of On an Overgrown Path – an inflection here, a small measure of extra time there – or the two performances of the Sonata and In the Mists, both hugely commanding. There is also the small matter of that DG recording including the Theme and Variations and this RCA-now-Newton having the 48 second A Recollection. Otherwise it’s really a duplicatory question. 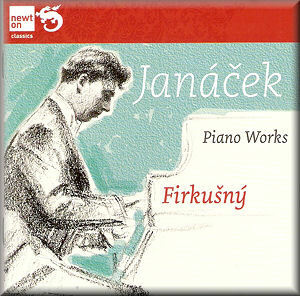 Having done that, I would have hailed Firkušný as the natural successor on disc to the pianist who introduced many to Janáček on disc in the days of 78s – Jan Pálenícek, who also made some early LPs of the composer’s music. I’d have added that the first Janáček disc Firkušný recorded was the Concertino, on 78s. Also, I should have noted in passing how great a loss it was that the greatest Czech pianist of the first half of the twentieth century, Jan Herman, never recorded any of the composer’s music. But I must put aside my enthusiasm to note that something has gone wrong with the tracking of Book I of On an Overgrown Path. It’s thrown all my intentions out of kilter. These things do happen, and Newton is an excellent label, and I happen to be an admirer of its work, annotation and booklet design. So please don’t think I am dismissing its retrieval work when I say that the second piece of Book I is not (in English) The Barn Owl has not Flown Away. It’s A Blown-Away Leaf. Anyone coming fresh to this performance will be stumped by this mis-tracking – it’s not the pianist’s caprice because he performed it perfectly ordered on his other discs – and I think the chore of forwarding to the correct second track which is the next one, and ending the cycle with correct track, which is the second … well, you get my drift. If you can live with this, I have no hesitation in recommending the performances, which are as good as you will ever find in this repertoire. If you can’t, then you should fall back, as I shall, on the original issue, which was RCA Red Seal 60147-2.